Many thanks to Carolyn Charles, retired Park High teacher and official historian of St. Louis Park Schools, for much of the following information. 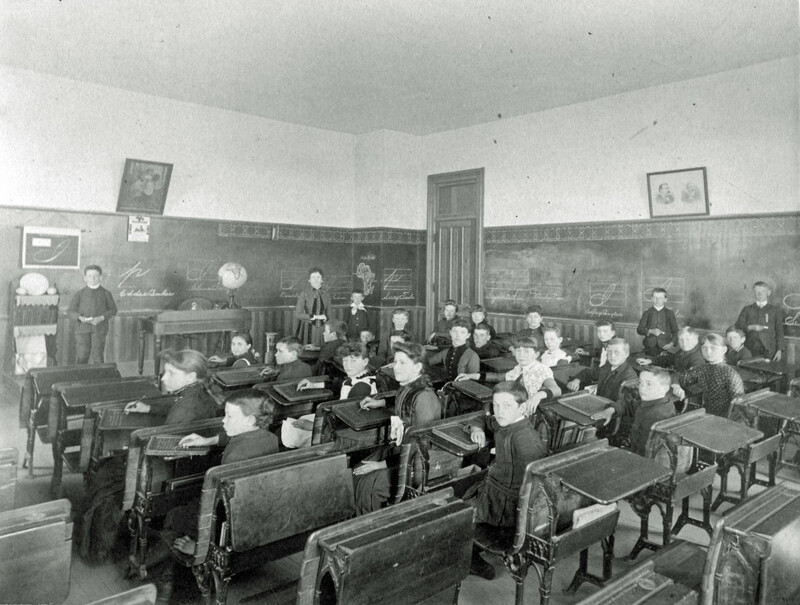 St. Louis Park’s Independent School District was organized in March 1888 with two elementary schools. One of its first tasks was to build a high school. The first lots proposed for the school were rejected as being too close to the railroad tracks. On June 26, 1889, the school board accepted 3-6 lots donated by the St. Louis Park Land and Development Company (T.B. Walker’s Syndicate). The location was at the southeast corner of present-day 37th Street and Alabama Ave. The front faced north – the address was 5925 W. 37th Street. The school was built in 1889 at a cost of $8,500. The School Board and the Village Council split the cost of the building, with the Village Council to hold its meetings on the second floor. Bonds to build a town hall were issued on December 20, 1889. The school opened January 6, 1890, with James T. Davis as Principal, Superintendent, and teacher. Mary C. Bates was the other teacher. (Mary’s sisters Bertha and Irene Bates were also teachers at the school at various times.) It was named Lincoln School on July 12, 1890. The original school was only half the size it came to be. A fire destroyed part of the building in the early 1890s and when the repairs were made it was voted to enlarge it. The top floor was used as a Village Assembly room and the first floor for the school. On August 6, 1894, the School Board asked the Village Council for a lease of the Village hall to the School Board to be used for educational purposes only. The Council agreed to lease the Hall to the School District for one year at $12.50 per month. The council room would be retained by the Council. 1894 was the year that St. Louis Park first had a high school. In 1900 the first seniors (six girls and a boy) graduated. Early graduation ceremonies were held in the Hamilton Building 2nd floor, used as the Odd Fellows and Masons’ Hall. A commencement program for the eighth grade, Lincoln School, was held on June 3, 1903. There were 19 graduates. At the end of a program packed with songs and recitations, Superintendent of Schools Herbert Carleton presented the diplomas. The next year he went into the real estate business. In the early 1900s, the city issued $12,000 in bonds to build the south end of the building. In 1902, the school was transferred from the School District to the Village. Indoor plumbing was installed in 1905. In 1914 the new junior/senior high school was built, and Lincoln became a grade school, although in 1930 it housed 7th graders. The next year, the 7th graders were moved to the Brick Block for lack of space. Classes were also held at the back of Union Congregational Church, which was across Alabama Ave. The Lincoln Mothers’ Club was organized in 1916. Mrs. W.H.D. Reese was its first President. The mothers provided hot lunches for the students and later raised funds for a cook by serving at a banquet for the Commercial Club. School colors in 1919 were green and white. On October 6, 1925, the Mothers Club met at the school and were entertained by the students. The Club voted to provide hot lunches to the pupils as in previous years. 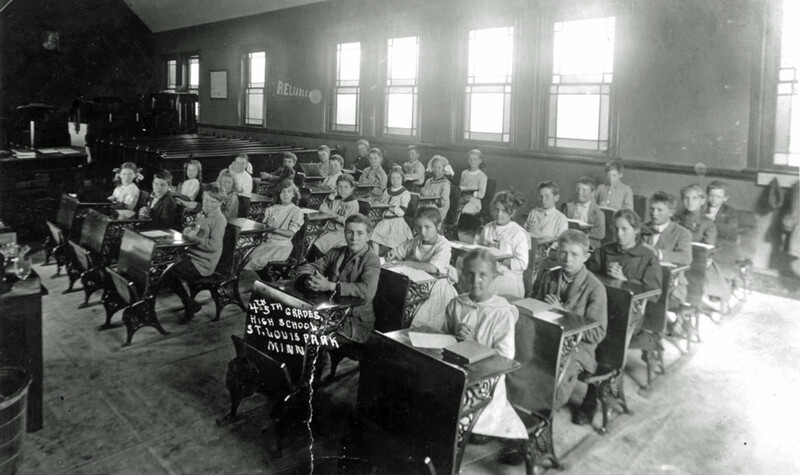 First grade, 1925. Not too happy. Typical activities in the ’20s were fundraising carnivals, food drives for school lunches, and giving Christmas parties and spring picnics for the children. In 1928 the Mothers Club staged the play “The Pranks at the Little Red School House.” This fundraiser proved such a success that they staged it again at Miles Standish School in Minneapolis. 1931 may have been the year that the Mothers’ Club became the PTA, as the president was a Mr. Whitfield. The activities of the group reflected the Depression, as collections were made for the needy. In 1932 members of the PTA signed a petition to be sent to Senators in Washington, DC regarding censorship of movies. Arthur Crosby was a janitor at the school in 1934. In 1938 the building was sold for $1 to the village and was used as the Village/City Hall until 1963. Other tenants along the way were the Hennepin County Historical Society (1938-1946), WPA (1939-40), Camp Lincoln Boys’ Camp (1946-49), Rural Hennepin County Nursing Committee (1951-55), a drivers’ license bureau, the Chamber of Commerce, and temporary Sunday School space for neighbor Union Congregational Church. Try as they might, the school district could not stay out of the building as the student population exploded after World War II. In 1946-1947, Lincoln School was used as overflow elementary school space for 120 students, grades 1-3. In 1947-1948 the building was used for grades 4 and 6. 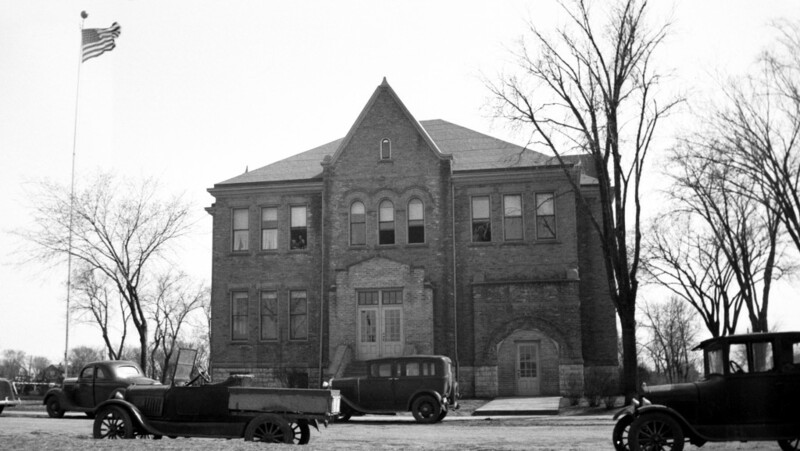 In 1949-1950 the building was used for grades 4 and 6. 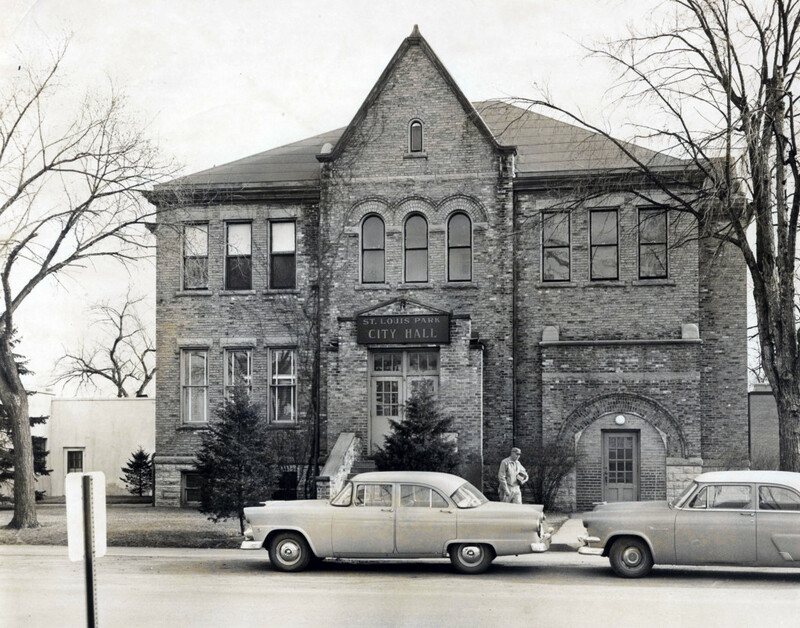 In 1966 the building was sold to Minnesota Rubber for $130,000. It was demolished shortly afterwards – a “giant clam” took one week to level the venerable building. The bell that had served Lincoln School was moved first to the Central building when it was the High School and then to the present-day High School, where it is displayed today. The St. Louis Park Historical Society has a well-worn painting of Abraham Lincoln from the school. Others have other souvenirs, including, presumably, a bust of Lincoln that was once on the landing on the way to the second floor.